You know how every house has that certain room that you explain to guests as the “junk” room, and you keep the door closed and act like there is toxic waste inside? That’s my son’s room. It is smaller in size with a whole lotta stuff, so organizing it was a challenge. First, we went through everything and made 3 piles. One pile for keep, throw away, and donate. That way you can see what is left over and pick out storage to accommodate it. I love the locker room style trend of some of the storage bins and I found these cute ones at Target on sale and they were really affordable. I love these because you can put anything in them from really small cars to larger stuffed toys and games. 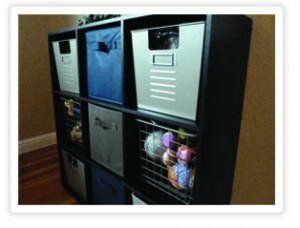 The locker style bins come with a label so it will be easy to locate items. If your little one can’t read yet, draw a picture of what is inside on the label. 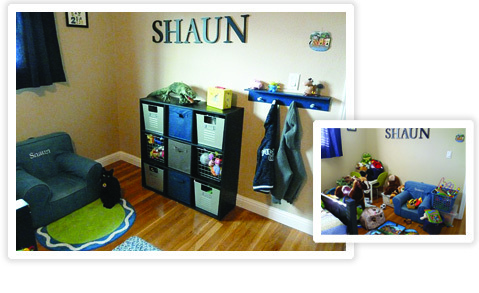 This cubby system is really convenient and saves space. Also found at Target was this cute wall shelf to hang jackets and backpacks. I placed it low enough on the wall for my son to reach in the event that he would actually hang something up. Now there is a place for everything and everything in its place.